Exporter of a wide range of products which include pramipexole tablet, caberlin tablets, bromocriptine tablet, memantine tablet, rasagiline tablet and donecept tablets. Pramipexole belongs to a class of medication called non-agonists. It acts like dopamine which is a natural substance of the body that helps in controlling body movements and thus helps in symptomatic treatment of Parkinson’s disease and restless legs syndrome. With our client oriented approaches, we are able to provide high quality Caberlin 0.25mg and 0.50mg Tablets. We search for the most effective and reliable products from certified vendors of the market. These medicines are developed under the supervision of experts and are safely packed. We try to meet the rising demands of our clients and provide our products in huge market scale. 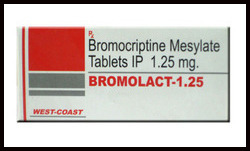 Bromocriptine is used to treat Parkinson’s disease (a brain disorder with abnormal body movements). 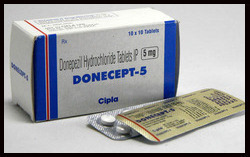 It is also used to treat hormonal problems such as excessive or abnormal breast milk production, fertility and polycystic ovary syndrome (health problem that can affect woman's hormone levels, periods and ovulation), high levels of a chemical such as prolactin (hyperprolactinemia) and acromegaly (abnormal and excess growth of hands, feet and face in middle aged adults caused by excess production of growth hormone). Additionally, it is used in the treatment of type 2 diabetes mellitus. 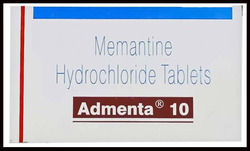 Memantine is used in adult patients to treat moderate to severe Alzheimer’s disease (disorder that causes mental confusion and forgetfulness). Memantine belongs to the group of medicines called psychoanaleptics. It acts by modulating the effects of increased levels of chemical substance in the brain called glutamate, and thus decreasing abnormal activity in the brain. Rasagiline is used to treat Parkinson's disease (nervous system disorder characterized by slow movements). Rasagiline belongs to class of medicines called monoamine oxidase B inhibitors. It works by increasing certain chemical substances in the brain () which is responsible for movement related function of the body. With our client oriented approaches, we are able to provide high quality Donecept(Done pezil) tablets. We search for the most effective and reliable products from certified vendors of the market. These medicines are developed under the supervision of experts and are safely packed. We try to meet the rising demands of our clients and provide our products in huge market scale. Looking for Alzheimers Medicine ?